Rent College Pads works hard to help college students at Indiana University of Pennsylvania find the best rental options for IUP housing off-campus in Indiana, PA. Whether you are looking for IUP apartments or houses for rent, Rent College Pads is your number one resource for IUP off-campus housing. Finding apartments at Indiana University of Pennsylvania has always been a chore. At Rent College Pads we are fixing that. All of our off-campus housing options have been verified and approved by our diligent team. We even follow up with you and the landlord for whatever apartment in Indiana you're looking for to make sure you have found your perfect house. Because there are so many options to consider before making a responsible renting decision, check out our guide to apartments in Indiana, PA! If you are interested in living off-campus housing near IUP or want to rent from a Top 5 Rated Indiana Landlord, you are going to want to start your search right away in September. Most leases are signed the fall semester a year ahead of the date that you would be moving in. So if you'd like to get a good IUP apartment or a house for three or four friends, make sure to lock up a lease as early as September and no later than November. But if you're living in a one-bedroom apartment or studio, you can afford to wait a bit longer. There are typically a good mix of Indiana apartments for rent early on in the second semester. Just don't wait too long after January. Going to a small school definitely, has some benefits. Specifically, it's cheap. Living in Indiana, Pennsylvania is relatively an inexpensive place no matter how many bedrooms you are looking for. For rooms of all sizes, the prices across the board are relatively the same. Typically, 1 bedroom apartments in Indiana are about 50% more expensive than two bedrooms or three bedrooms, but in general, IUP apartments are very affordable. B&L Properties specializes in IUP off-campus housing and owns a number of student rentals in downtown Indiana. The company prides itself on making the transition from the dorms an easy one. The Apartment Store’s branch in Indiana, PA manages a handful of properties within walking distance to campus. Students seem to love the locations and conveniences they provide, including a fitness center, off-street parking and more. Lazor Brothers offers partially furnished student housing within walking distance to IUP. Students say the rent prices are incredibly fair, and the management team is always accommodating to the needs of its tenants. Westgate Terrace offers studio to four-bedroom units less than two miles to IUP. Residents appreciate the pet-friendly environment and say the apartments are clean, safe, and quiet. Located next to the Eberly College of Business, Pratt Studios features one of the most convenient off-campus locations. In addition to a nicely furnished studio, the rent you pay each semester—that’s right, you only have to write two checks— covers everything from utilities to cable and the internet. Whether you just want to grab a beer with some friends or eat some delicious food these bars never seem to disappoint. Check out Philly Street for lots of restaurants that deliver to your doorstep. In addition, you can always head downtown to check out some cute shops, restaurants, and beautiful historic buildings. Skirting the southeast edge of campus, the Wayne Avenue neighborhood is a great area with a nice mix of both residential and city property. Most of the off-campus housing south of the IUP University campus are Indiana houses for rent, with many of them featuring two or more bedrooms for students looking to live with their friends. Attractions in the area include the Indiana County Fairground and Mack Memorial Park, as well as the Historical and Genealogical Society of Indiana County. 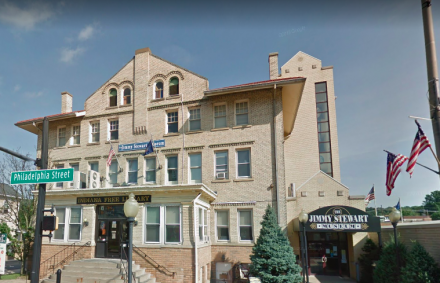 In addition to museums and parks, the Wayne Avenue neighborhood is host to a variety of cheap dining options — perfect for college students on a budget. Red brick and grey slate make up the gorgeous historic buildings that line Philadelphia Street in Downtown Indiana, PA. Like most great urban spaces, Downtown Indiana is host to restaurants, clothing shops, bars, wine stores, banks, cafes and more. 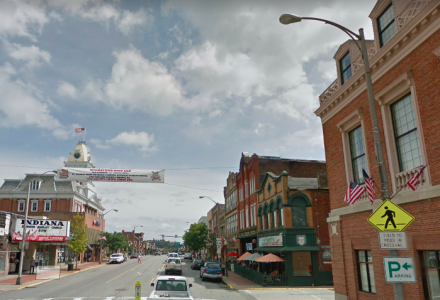 It’s also the source of many nice apartments and homes for rent near IUP, and although their location makes them more expensive than other houses or apartments in Indiana, PA, it also makes them close to the city’s nightlife scene. If you like being near the heart of the action, Downtown Indiana is the perfect fit for you. “Merry Christmas, you wonderful old Building and Loan!” If you’ve seen It’s a Wonderful Life, you’ll know that quote belongs to George Bailey, played by the 20th century mega-movie star Jimmy Stewart. 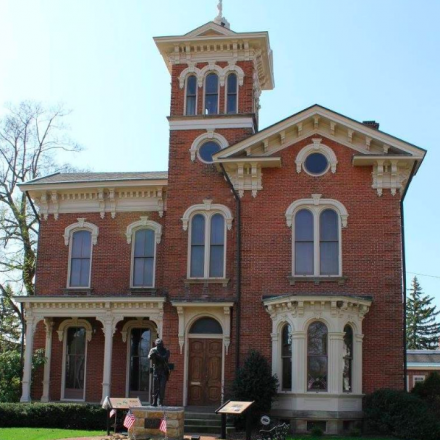 Indiana, PA was his hometown, and you’ll find the Jimmy Stewart Museum right along Oakland Avenue, just north of IUP. If you choose to live along the spacious and cheap homes along Oakland Avenue, you’ll be right near the museum and other great places like the Oak Grove Park, the Commonplace Coffee House and Roastery and a multitude of convenience stores. The neighborhood is just minutes north of Indiana University in Pennsylvania, so don’t worry too much about commuting to campus! There are lots of great places to find homes near IUP, but if you’re looking for a great apartment, look no further than Maple Street. Although it’s further south from campus than many of its counterparts, Maple Street has an ample selection of apartment complexes for students to choose from. The area is away from the noise and action of campus and downtown, which is great for those looking to keep their home lives separate from the hustle and bustle of college living. Like the Wayne Avenue neighborhood, Maple Street is close to Mack Memorial Park, and its streets are full of trees and greenery. In addition to the nice apartments here, there are also a variety of houses for rent near Maple Street. Because of its open spaces and large yards, living on Maple Street is a great idea for anyone who values the beauty of nature and quietude.